We all rely on a vast expanse of words every day, but there is one phrase that many of us have in common because we use it so habitually, it becomes a part of our routine lives: “Hey Siri!” or “Hey Alexa!” Many of us possess technology that permits us to access virtual assistants like Siri, Amazon Alexa, Google Home, and countless more. We use them every day to help us effortlessly carry out day-to-day tasks, but did you know that our virtual assistants are prime examples of Machine Learning? Machine learning is the amalgamation of data science and AI (artificial intelligence). In other words, AI lets computers accumulate data and “learn” without essentially being programmed. Data Science, Artificial Intelligence, and Machine Learning are all fascinating topics that provide great insight into programs that we utilize every day. In this paper, I will explicate all three subjects in great detail, give you a brief history of Machine Learning, and elucidate its distinctive main types. In preparation for this paper, I did extensive research online, using different sources to assemble information on Data Science, Artificial Intelligence, and various types of Machine Learning. This is my analysis of the subject based upon the data I was able to accumulate. As mentioned above, there are numerous types of machine learning, and they are going to be the foundation of this project. I’ll focus on three focal types: Supervised Learning, Unsupervised Learning, and Reinforcement Learning. I’ll explain all these methods after elaborating the essential details about Data Science, AI, and Machine Learning. I believe this research study is significant, especially since data science is an up and coming field that incorporates both social science, and artificially intelligent machines – which are things we recurrently see day-to-day. Machine learning is an engaging subject to learn about, so I believe this study will benefit you because you will be able to learn more about the world around you and form your individual opinions about these topics. I decided to research machine learning because we use so much technology in our day-to-day lives, although we seldom know how it works. So, without further ado, let’s take a look at what data science is all about. Clearly, Data Science is a field of study that applies different processes to withdraw information from data. It is a mechanism for evaluating data to understand real-life occurrences, and it’s advantageous in many ways. Trying to pinpoint patterns in amorphous data can help companies downgrade costs, be more effective based on what the data tells them, and proliferate the organizations’ advantages by recognizing neoteric market opportunities that wouldn’t have been discovered before the use of Data Science. Data can be elicited from many different places; a great deal of it comes from social media platforms, cell phones, the websites you visit and the internet searches you make, etc. Many companies use this data to their advantage. However, cognizing large amounts of structureless data to make business decisions often proves too arduous and mind-numbing for corporations, thus bringing about the materialization of data science. So, what makes Data Science so vital? Why is it relevant? Well, over the past few years, data science has come a long way. There are many reasons why it is an integral part of many industries. It helps companies understand their customers in a way that was never conceivable before. It allows them to associate with their customers more individually. Another characteristic of data science is that it can be applied to practically any sector: education, travel, healthcare, etc. Overall, the field of data science has a promising future and much potential. It is half of what goes into Machine Learning; the other half is artificial intelligence. Artificial intelligence is an intriguing subject, and after reading about it, I think you will see why. In essence, artificial intelligence is intelligence shown in machines, unlike the natural intelligence that humans and animals have. It is fundamentally a word for simulated intelligence in machines. AI machines are programmed to act and think in the way humans do. The basic idea behind artificial intelligence is that human intelligence can be demarcated so that a computer can impersonate it accurately. Artificial intelligence can mean a conglomeration of many different things to many different people: self-driving cars, robots, and machine learning, as we will further discuss. But, in its foundation, AI is just the expression for computers being programmed to act like humans, even in the simplest of ways. Some of the activities AI computers are designed to complete are speech recognition, problem-solving, planning, and learning. There are many examples of artificial intelligence that we see in our everyday lives, such as Siri and Alexa. Everyone knows who Siri is: Apple’s personal assistant, the voice-activated program that many of us interact with on a regular basis. Siri can do almost anything for us on the smartphone: she can find information, give directions, text and call, etc. But she’s not the only assistant we all know of – Amazon Alexa, the smart home device, seized the world’s attention when Amazon first introduced it. Some of the less known examples of AI, however, may surprise you. Websites like Netflix, for example, provide precise recommendations based on the user’s rejoinder to movies they watch. Another example of Artificial Intelligence is Facebook! Facebook uses AI for many things, such as scanning faces. One of the core parts of AI is Knowledge Engineering, a field of artificial intelligence that makes guidelines to apply to data. Machines can only acquire artificial intelligence if they have existing information programmed into them. Robotics is also a significant field when it comes to artificial intelligence. Robots require intelligence to handle many different basic tasks – so, AI can be seen almost anywhere nowadays. Finally, one of the most prominent core parts of AI is Machine Learning. Typing “What is Machine Learning” into a search engine can lead to a plethora of different websites and academic research that describe machine learning as many diverse things. To put it briefly, machine learning is just the science of getting computers to learn in the same way that humans do, and to augment their learning over time without explicitly being programmed. This happens when they receive different fragments of data and information in the form of real-world interfaces and occurrences. Machine learning encompasses many different algorithms, and they are usually catalogued by learning type or correspondence in their functions. In this project, I compared the three primary learning types. But regardless of learning type or similarity, all machine learning algorithm combinations consist of representation, evaluation, and optimization. Representation is the language that the computer already understands. Evaluation is the objective function. And finally, optimization is the search method for classifying the data. The core goal of all the algorithms is to categorize or generalize the data further than what the computer has seen before. An example of machine learning that occurs every day is Spam Detection when we check our email. When the computer sees an email in your inbox, it uses previous experiences to move the spam emails to a spam folder. We all now hopefully understand the basics of Data Science, AI, and Machine Learning. But how are they all correlated? Well, data science is a much broader concept than machine learning. However, Machine Learning tries to generate systems that can learn from data. It can be used in an extensive variety of settings. Data science is the extraction of knowledge from data. So, they are similar because they both try to learn or get information from sets of data. 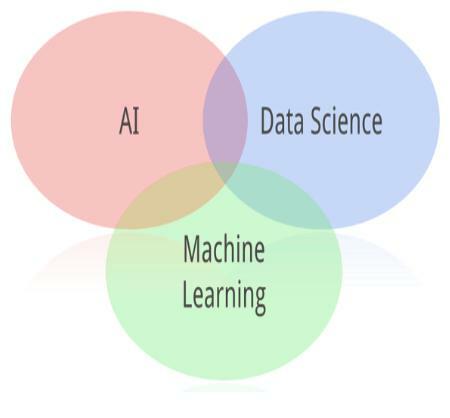 Machine learning also includes a couple of techniques that Data Science uses, and Data Science also does not solely rely on Machine Learning. On the other hand, Machine Learning can be considered a branch of Artificial Intelligence. But AI, as a field, is much more than Machine Learning. However, a lot of grueling AI challenges have been resolved with Machine Learning, but it can also be used for many things that are not considered Artificial Intelligence. In conclusion, Machine Learning is a part of both Data Science and AI, but neither of those things relies on it as a whole. Here are some significant milestones in the history of Machine Learning. 1950 – Alan Turing created a test of a computer’s intelligence called the Turing Test. In the test, the computer must be able to trick a human into thinking it was also human. 1952 – Arthur Samuel wrote the first computer learning program. It was a Checkers game, and it improved with the game the more it played. 1957 – Frank Rosenblatt designed the “Perceptron,” a computer program that simulated the thoughts of the human brain. 1967 – A new algorithm was invented, called the “Nearest Neighbor” algorithm. It allowed computers to use basic pattern recognition. 1979 – Students that went to Stanford University invented the “Stanford Cart,” a machine that was able to navigate obstacles in a room without being programmed. 1985 – NetTalk, a program that learned to pronounce words the way a baby does over time, was invented by Terry Sejnowski. 1997 – Deep Blue, a chess-playing computer developed by IBM, beat the world champion at chess. 2006 – The word “Deep Learning” was used to explain algorithms that allowed computers to distinguish words and objects in pictures and videos. 2012 – The Google X Lab created a machine learning algorithm that was able to browse YouTube videos and automatically identify those that contained cats. 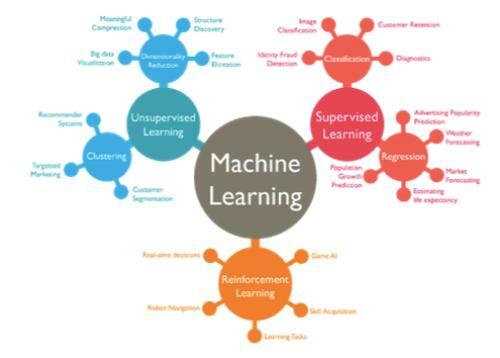 The first type of Machine Learning is called Supervised Learning, which occurs when an algorithm gains information and learns from example data and the target responses for that data. The algorithm works so that the computer will be able to predict the correct response later when it is given new examples. It connects the input to an output based on previously seen examples of input-output pairs. Think of it like this: you are in math class, and your teacher wants to see how good your number skills are. So, this is what she tells you: I have my first number, and I perform a mathematical operation on that number. The resulting number is my second number. My first number is 2, and my second number is 4. Then, she gives you another example: I performed the same mathematical operation on these first and second numbers: 5, 10. She keeps giving you more example pairs: 1, 2. 6, 12. 9, 18. Then, she says: Now, take the number 7 – consider it to be the first number. What will the second number be? If this same problem, and these same examples, were fed to the computer in code, it would use Supervised Learning to figure out what the second number would be based on the previous examples, and its answer would be 14. So, to sum it all up, Supervised Learning is the same type of learning you get when you are being “supervised,” or taught, by a teacher. The next type of machine learning is Unsupervised Learning. That’s right, you guessed it: it is pretty much the exact opposite of Supervised Learning. Unsupervised learning occurs when the computer learns from plain data examples that are not associated with each other. The algorithm’s purpose is to determine the patterns in the data on its own, instead of being given the pattern and being instructed to find the outputs for each input. The purpose of this type of learning is to have the machine find structure in the data that a human might not have noticed for a long time. It is used to figure out new correlations or features in the data quickly, and it is instrumental in aiding humans in finding the meaning of data. However, Unsupervised Learning is unique because since the examples given to the computer are not labeled, there is no way of telling how accurate the results of the algorithm are. If you’re not quite following, here’s a real-world example of what Unsupervised Learning does: say, for a homework assignment, your teacher gives you this list of animals: chipmunk, lion, crocodile, chameleon, leopard, lizard. She tells you to find a correlation between the different animals, and then group them. If these same instructions were given to a computer, it might group them by animal type: one group of reptiles (crocodile, chameleon, lizard) and one group of mammals (chipmunk, lion, leopard). But another computer might group it by letter – the letter C (chipmunk, crocodile, chameleon) and the letter L (lion, leopard lizard). Neither of the answers is necessarily wrong, and that is why it is not easy to figure out how accurate the computer is. The last type of machine learning is Reinforcement Learning. Reinforcement learning is different from Supervised and Unsupervised. It occurs when the computer is given data that isn’t labeled, just as in Unsupervised Learning. However, when the computer gives you its feedback or solution, you give it either positive or negative feedback – based on the solution that the computer proposed. The computer will change its solution based on your feedback, and this process repeats until you are happy with the results. Reinforcement learning is just like learning by trial and error in the real world. Trial and error help the computer learn because it teaches it that certain courses of action are more likely to succeed than others. I hope you learned a lot from this research study. I certainly did, especially with all the research. I think machine learning is a captivating subject, and there are many ways to think about it. Will AI take over jobs in the future, leaving humans unemployed? Moreover, what is the best type of machine learning? Which one is most like a human’s way of learning? Now that I know more about some everyday household items we use, I will never think about them in the same way again. Next time I ask Alexa what time it is, I think about the millions of algorithms she uses to recognize my voice and figure out what I said, all in a tenth of a second. Next time I ask Siri to call my mom, I think about how the only way she knows how to answer that command is because she has heard it before. We, humans, are not the only ones learning more about the world around us as we go to school and work; the machines are as well, and that is precisely the reason why machine learning, artificial intelligence, and data science, all combined, are so brilliant. In conclusion, I believe I achieved my goal with this project, which was to learn more about the machines all around me. When I started, I was only mildly interested in the topic and researched it out of curiosity, but now, after learning so much, I want to learn more and do even more projects that relate to machine learning, data, and AI. Also, if you want to learn more about this topic as well, I advise you to browse the different websites I listed under my Works Cited and maybe even do your own experiments. Who knows what you’ll find out? When it comes to computers acting like humans, the code is the limit.